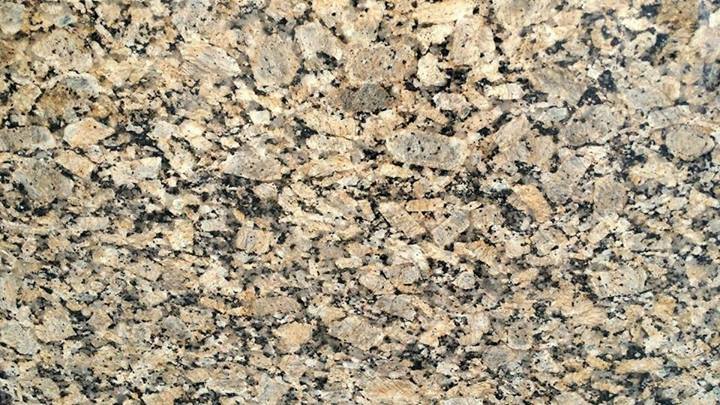 Giallo Vicenza granite is quarried in Brazil. It is primarily a beige/gold stone with specks of black, brown, gold, and translucent colored quartz throughout the slab. It is also very consistent and uniform in color with medium variation. Giallo Vicenza granite is a rich, gold colored stone that will have some slight veining or movement depending on the slab. It is the perfect blend of light beige to dark brown with simple golden hues and movement creating versatility and style. When Giallo Vicenza countertops are paired with light cabinets they complement the tones of the cabinets, and the dark brown mineral deposits add a little depth to the room. The golden tones warm up the overall appearance for a clean and comfortable look and feel. When combined with dark cabinets there is a slight contrast between the beige granite and the dark cabinets. The cabinets pick up the dark tones of the countertop, along with the translucent minerals, for an elegant appearance.